I really like shooting special photographs of my close friends to keep as memories that reflect their personalities but this isn’t an easy thing to do because I don’t ever want them to feel uncomfortable or force the photo because I want to really capture them in the shots so that they are personal. I have said to Keli that I want to shoot a photo with her for ages but it has just never ever happened and I have never been happy with the ideas that I have had until today. 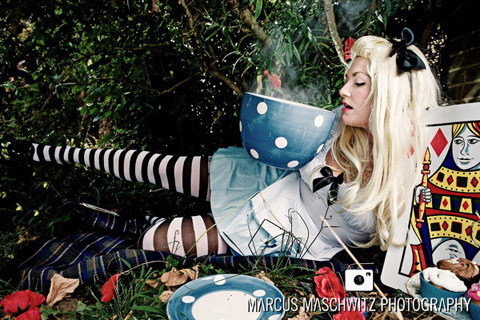 It was Keli’s birthday and she dressed up as Alice from Alice in Wonderland which seemed fitting to how she is so I decided (assisted by Warren Zanin) to create a fantasy theme under some bushes in their back garden with some props and this is the result. I have always been asked what my setups are and I have so little time that I never ever show them but decided that I would make the effort for this one because I have just been sent a photo of me shooting this shot and I think its funny. Basically I used 4 X Nikon SB-800’s for this shot with the main light going through a Rayhead Ring Flash and then only the fill light on camera right being shot through an umbrella to fill in the space under the bush. I really like this shot and would love to hear what you think of it so feel free to let me know if you have the time even if its just questions regarding this shoot. 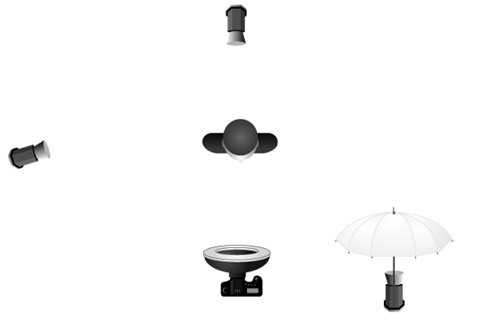 Below is the final photo then a rough setup diagram and then a photo of me working on this shoot. Currently listening to : The Postal Service – The District Sleeps Alone Tonight. Dude, love the style of this. Always rad to see you trying different styles, and breaking out of the box a bit. The lighting is awesome, but you know that I respect your lighting setups. Love them actually – use them for inspiration where I can always. Nice to see the diagram of your setup as well. Gives a nice insight. Miss shooting with you guy. love the use of the ring flash…looks uber!